I was awed by Michael McCormick’s stunning novella, which is based on his experience in Vietnam during the Tet offensive in 1968. There is such power and emotion in this simply told story of a young Marine, Sean, or Mac, as he is known in Vietnam. 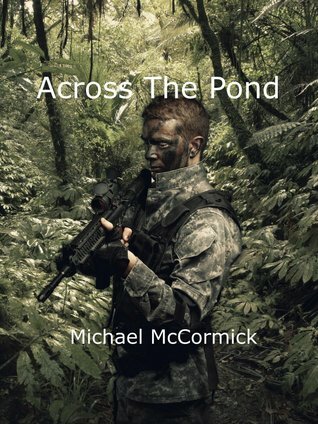 Gripping, raw, visceral, McCormick assaults your senses, telling the story in a straightforward manner, like the great masters, with showing, never telling, without distracting embellishments and, in McCormick’s own beautiful imagery, like a pebble skimmed across a pond with ripples expanding outward. It is a story of betrayal, of sights, experiences, and behaviors too horrifying and painful to be analyzed or interpreted. McCormick leaves that to the reader. He paints with a broad brushstroke, never sparing the depth of atrocity and yet at times, writing like a poet, speaking to our hearts and souls. McCormick gives snippets of life before Vietnam to flesh out the man Sean is, to give a glimpse at how the man of courage and honesty and loyalty develops: a man who loved his family, his country, and felt it his duty to serve, a man who pushed aside his fears in Vietnam to attempt to save his brothers, to do what no one should ever have to see or do. I’ve seen realistic portrayals of Vietnam in movies but this novella has the urgency and ring of truth like no other. I felt the action, the fear in the belly, the dry mouth McCormick speaks of. This is pure story without a false move. McCormick does not step out of the moment. You, as reader, are always in the present. No details, analysis, or introspection distract from the sense of immediacy. How does McCormick do it? By putting us there: we are on the battlefield going house-to-house, street-to-street, searching out the enemy, ever fearful of mines and bombs and gunfire. We feel the betrayal of authorities, the turning of backs against returning Veterans, the compassion of a woman wounded by a war death, her search of understanding, because it is our own. I can’t help but like Sean with his love of family and country, his courage and integrity, his loyalty to comrades. There is a lovely scene of how Mac is touched by the honesty of a woman looking for answers: two people wounded by war who come together briefly to heal. There are other poignant moments, an encounter with a homeless vet, sharing a sandwich. Stunning, simple, evocative. I know someone who risked his life in Vietnam to save others. I’d always wondered why he did it, what went through his mind. He’d get embarrassed and couldn’t explain it—“it’s what I was supposed to do.” With one paragraph in this story I understood a soldier’s perspective: the fear, overcoming it, perhaps the call of duty, the desire to help fallen comrades that stirs the altruistic action we call heroism and courage. I don’t think anyone knows how he or she will respond in this situation, but that episode made it clearer to me on a feeling level. In his eloquent Forward Ron Kovic, author of the autobiography, Born on the Fourth of July, compares McCormick to Erich Remarque and Steven Crane. I would add Hemingway to that list for McCormick’s brevity of language, the sparse descriptions, and letting the story speak for itself. I hope McCormick will write more. He is a great voice for a generation of Veterans who were not treated well by the country they fought for. As Ron Kovic points out, this story, like All Quiet on the Western Front and Red Badge of Courage, rises above one war; it speaks of the brutality and horror of every war and of the men and women who fight it.